We all work hard to enhance our family’s financial status &lifestyle, to fund our children’s education and to secure a respectable retirement for ourselves. However, life can sometimes be hard and an unfortunate contingency may bring misfortune to the family by hampering the family’s finances. Term insurance is one of the simplest forms of life insurance. A term plan offers a sufficiently large amount to your family at the time of death of the policyholder. What's more, this comes at a very affordable price. The plan covers your family from the risk of death for the limited period called term. The benefit of term insurance is that you can ensure financial safety for your family even if you are not there, at affordable rates. Like any other life insurance plan, you need to pay premiums on your term insurance plan for the selected premium paying term, which can be paid based on the frequency chosen. Why should you buy Term Insurance? Death, disability, disease, all are realities seldom talked about. However, all three are realities we cannot possibly overcome with certainty. Term insurance is one tool, which can save you and your family from the financial hardships brought upon by these three and similar disastrous conditions. Consider for example a family of four, where the father is the primary breadwinner. The family needs about Rs. 50,000 a month to fund regular expenses like rent, food, other groceries, electricity, water, education fee etc Debts, if any are over and above this. The loss of life cannot be compensated, however, a term plan can help to tide over the financial requirements of a family. Save Tax U/S 80 - The premium you pay for your term insurance plan can save tax for you. Critical illness premium saves tax for you u/s 80D, while life insurance premium is counted u/s 80C of Income Tax, subject to conditions. Long Policy Term - You can opt for a longer policy term to stay protected. You can stay covered for up to 50 years with a term life cover. Low Entry Age - Most term Plans have a minimum entry age of 18 years; that is, you can buy term insurance cover as soon as you hit adult age. Death Benefit as Regular Income - Modern term insurance plans allow you to give your dependents a regular income along with the lump-sum benefit in the event of your unfortunate demise. Premiums Returned on Survival - You can now receive all your money back if you survive the policy term. T erm insurance plans with the return of premium benefit offer to return all the paid premiums on the policy as survival benefit. Add Disability Benefit to Your term plan - Any kind of disability due to accident or illness can affect your income earning capacity. You can add disability benefit with your term plan at affordable prices. The disability cover is available on payment of additional premium. High Maturity Age - Of all life insurance plans, term insurance offers the life cover for the highest age bracket. You can continue the term-insurance cover up to the age of 85 with Max Life Insurance. How to Choose the Best Term Plan? Claim settlement record of the Insurer- Claim settlement record of a life insurance company indicates the ultimate moment of truth for the customer. Claim settlement record can be assessed through a per cent number (Claim Settlement Ratio) released by IRDAI (Insurance Regulatory and Development Authority India) every year. A consistently good claim settlement ratio indicates a robust and quick claim settlement process. Which means your dependents will have it easier to receive the death claim benefit from the insurer. Know the Existing Customer Experience- Buying a term plan is usually only the start of the story. You need to manage your plan to maximise your benefits. Engaging with an insurer which not only offers a better plan but also helps you stay updated on the terms helps a lot. The customer service from the life insurers can help the policyholders stick with the insurer longer. Persistency Ratio declared by IRDAI annually can help you judge the insurer’s service quotient. Choose Your Benefits Carefully- Death is not the only risk you need to cover against. Apparently, disability, life-threatening diseases, etc. can also damage your financial health. Adding these benefits along with few additional value-added features like ‘premium waiver’ can ensure better financial backup. Also, since term insurance premiums are not as high compared to other types of insurance plans, adding these benefits to the plan does not burden your pocket much. Look for Regular Income Payout- Traditionally life insurance policies have been paying a large sum of money to the dependents of insured. Often the dependents are not equipped to handle such a large sum of money to meet all their needs and goals. Modern term plans offer regular income option along with the lump-sum so that they can look after their immediate needs while investing the lump sum for future goals. Thus, selecting a regular income payout option while buying your term plan may save a lot of hassle for your dependents later. How long should be the term of your term plan? The ideal term for your term insurance cover should be as long as you expect your financial liabilities to last. For example, if you feel that your home loan may stretch a couple of years after your retirement, your term insurance should last at least as long as the loan after your retirement. However, in the term insurance, it may not always be possible to increase the term later. Therefore, you need to ensure a long cover period at the time of buying the cover. To avoid all guesses and stay secured for life you can opt for the longest tenure. You can easily manage the term cover after your retirement with ‘Pay Till 60’ feature of Max Life term plan. Pay Till 60 ensures that your premium payments stop at 60, but the life cover continues till the maturity age you had selected. Basic Term Plan- Basic term plan is the term plan with life cover and pays a death benefit in a lump sum only. This plan does not have any maturity benefit. Term Plan with Monthly Income- Term plan with monthly income gives you the option to ensure a regular stable income to your family apart from a lump sum death benefit. Term Plan with Growing Monthly Income- Inflation is a major factor when it comes to regular household expenses. Term plan with growing monthly income gives the death benefit as growing regular income to your family along with a lump sum amount. Term Plan with Return of Premium- Term plan with return of premium is a specific kind of term plan where all the paid premiums are returned back to you at the end of the maturity. Group Term Life Insurance Plan- Financial security is one of the essential needs of your employees. Group term life insurance plan is the most affordable way to ensure financial security for your employees’ families. How the Term Insurance Plan from Max Life helps You? Buying term insurance early from Max Life can help you keep up with your growing financial status and family. Max Life offers increment of Sum Assured of term plan at major life stages in your life, such as Marriage, childbirth, etc. This is available on payment of additional premium. Additionally, with Max Life Insurance you can be assured that your family will receive the due benefit within a short period, and without having to run from pillar to post for it. Max Life assigns a Claims Settlement Officer immediately to your claim, to assist you with the process for faster claim settlement. Visit the website and click on Calculate Premium to start the process. The first form only asks a few basic questions related to age, contact information, smoking habits and annual income. Once you submit the form you will receive the quote for the maximum sum assured you are eligible for. Maximum sum assured is based on your annual income. While buying term insurance, you can increase or decrease your sum assured as per your need. Your premium amount will adjust accordingly. In the first step, you have calculated the base premium of the term insurance plan. However, term insurance plan only carries a death benefit, which does not offer protection from other risks. Adding these benefits may increase your premium cost. However, these benefits are useful additions to the basic plan and will be quite helpful in keeping your finances in order in case of emergencies. Insurance is a promise based on trust between the insured and insurer. Thus, to cover your risks, life insurer will ask multiple questions related to health and occupation. After completing your application form, you can pay the premium and submit the documents required to complete your application. Term life insurance is an affordable type of life insurance that provides your family with financial support in case of an unfortunate event. You need to pay a small amount of premium each year for a given period of time to secure the financial future for your family. This policy will help your family maintain their lifestyle and achieve their goals in your absence. For example- When you buy the Max Life Term Insurance Plan you will choose a Sum Assured of (example 1 Crore) for a desired policy term. 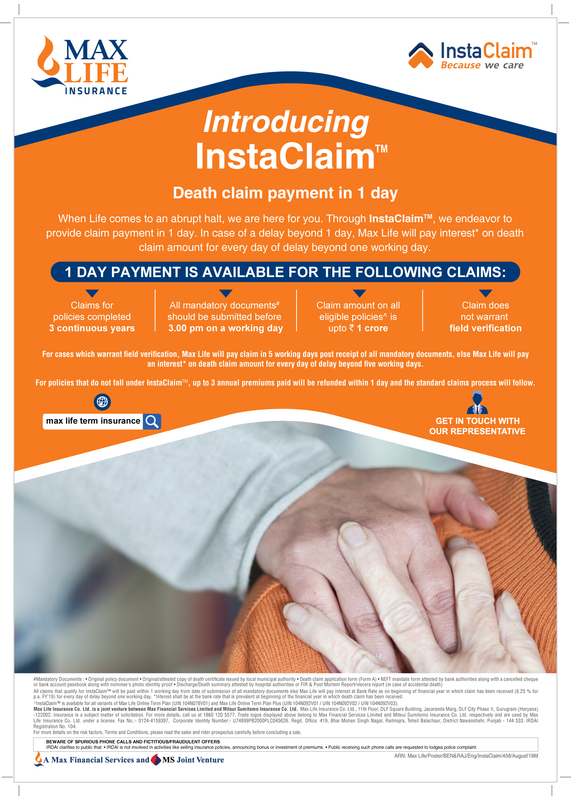 Subsequently, in case of your untimely demise, your family will receive the entire sum assured as death benefit, subject to fulfillment of conditions. Term insurance plans, offer you flexibility to choose mode of premium payment (Monthly, quarterly, half yearly or annually) and the death benefit payout option (Lumpsum payout/Monthly income/Increasing monthly income). With such term insurance benefits, you can ensure that your family is able to manage their financial expenses even after your demise. Whether it is the lifestyle expenses, debt repayments or expense such as higher education or marriage of your children, the sum assured can helpmeet them all. At a nominal annual premium, life insurance term plan is one of the most inexpensive ways to ensure that your family continues to live a decent life even in your absence. Moreover, by taking rider benefits, you can safeguard your family not just in the case of your death, but also against physical disability or critical illnesses. Riders are available on payment of additional premium. What Is the Difference Between Term Insurance & Life Insurance? Life insurance is an umbrella term that includes all kind of insurance plans – term insurance, savings and income plans, ULIPs and so forth. In general, if you buy life insurance, then you’ve to pay annual premiums that get added up and the payouts can later be provided as maturity benefit or death benefit. However, term insurance policy is a category of life insurance plans that offers aspecified sum of money as a death benefit to your family. You only need to pay small premiums regularly in order to safeguard your family in case you meet with an untimely death during the term period. Depending on whether you are solely seeking protection for your family or also investment benefit, you can choose between the two. However, having a good term insurance coverage is a good way to secure your family financiallyin your absence. Is Buying Term Insurance a Good Idea? Term life insurance is one of the best ways to secure your family financially in case of your untimely demise. Term insurance coverage provides a fixed amount of sum as a deathbenefit if you meet with life’s eventuality during the policy period. It is a good idea to invest in a term life insurance policy as you only need to pay small annual premiums against a considerable sum. Moreover, this premium amount is subject to tax deductions, which adds the cherry on the cake. The term insurance coverage amount, thus, enables the insured’s loved ones to lead a decent life and achieve all their goals even in the absence of the breadwinner. Therefore, having the best term insurance coverage is a good way to secure your family, even after you are no longer present to support them financially. What happens to term life insurance at the end of the term? When you purchase a term life insurance policy, you purchase it for an agreed term or duration, say 30 or 40 years. You pay premiums during your premium payment term, and in case of an unfortunate event of death during the policy term, your family gets the death benefit Some plans offer various other death payout options like monthly income or increasing monthly income over and above the lumpsum payout. Term life insurance is the simplest form of life protection and provides sum assured on the demise of the life assured. However, at the end of the term,in case of survival of thelifeassured, term insurancecoverage ceases, and nothing is payable. What documents are needed to buy term plan online? While purchasing a term life insurancepolicy online, you can upload the copies of these documents onto the insurer’s website or email it to their customer service id or courier them to the nearest branch. For how long should I buy term insurance plan? This needs to be calculatedextremelycarefully, aspicking term life insurance with the right tenure is crucial. Generally, term life insurance policies are available with tenure between 10 to 50 years. Choosing the policy with longer duration is wise. This way, you will be covered for a longertimeframe, as long as you need it. If not the longestterm, you must at least buy term insurance that provides coverage up to your retirement age. For example, if your present age is 25 and you plan to retire at 60, it is smart to buy term insurance with 35years of policy tenure. While deciding to buy term insurance, also consider the number of years until your children are dependent on you and the length of your mortgage (if any). How much term insurance you need? Experts usually propose a term life insurance cover which is at least 10 times of your annual income, 15 to 20 times is always a better option. Include additional cover for your liabilities in ithome loan, vehicle loan, personal loanand you are secured. For instance, if your annual income is Rs. 10 Lakhs, it is ideal to buy term life insurance cover of at least Rs. 1 Crore, assuming that you do not have other liabilities. In case you have a house mortgage of Rs. 25 Lakhs cover, include this additional Rs. 25 Lakhs as additional cover in your term life insurance coverage. What are the income tax benefits with term insurance policy? A policyholder of term life insurance plan is eligible for income tax benefits. Both, the premiums paid, and the death benefits offer tax benefits under income tax regulations in India. Under Sec 80C, premiums paid up to Rs. 1.5 lakh p.a are exempted from income tax. Moreover, it could also include the premiums paid for your spouse and children. Term life insurance policies issued on or after 1stApril 2012 are available for tax deduction,and the deduction is limited to 10% of the total sum assured. Apart from providing tax benefits on premiums, online term insurance plans also offer tax exemption on the death benefits under Sec 10 (10D) of the IT Act. The death benefit received in the form of sum assured by the beneficiary of the life assuredis fully exempted from tax under this section and comes without an upper limit. © 2018 Max Life insurance Co. Ltd.